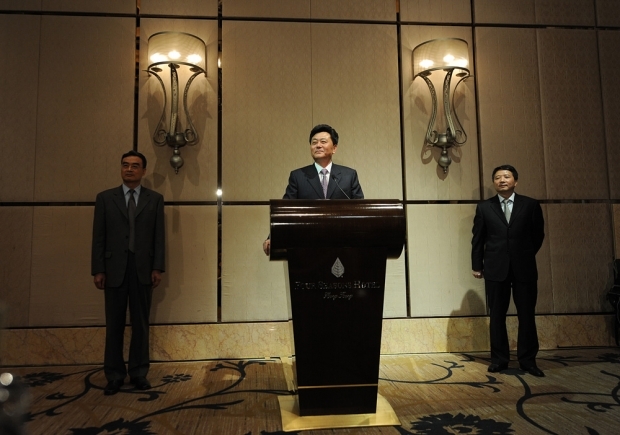 Li Gang, Deputy Director of the Beijing Liaison Office, speaks at a news conference in Hong Kong on May 24, 2010 during a rare meeting of the Hong Kong Democratic Party with Chinese officials to talk about political reform. A deadly hit-and-run at Hebei University by his unapologetic son has sparked outrage across the mainland. A deadly hit-and-run at Hebei University by the unapologetic son of a high-ranking official has sparked outrage across China, with early efforts to cover up the incident ultimately leading to father and son both making tearful apologies on national television. In other news, China stands accused of clamping down on the export of sensitive rare metals, while a new Chinese prize makes a surprise international debut. This week on Sinica, we discuss these developments and more from our studios in the heart of downtown Beijing. With Kaiser Kuo still out of the country on an international speaking tour, Sinica co-host Jeremy Goldkorn takes the reins today. Joining him in the studio are Sinica regulars Gady Epstein, Beijing Bureau Chief of Forbes magazine; Will Moss, popular blogger at Imagethief and expert on public relations in China; and David Moser, an old China hand and now Academic Director for the CET program in Beijing.